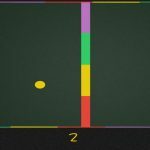 A fresh, new game created by Crazy Labs, Snake VS Colors prompts you with a challenge: can you get your snake past a wide variety of obstacles without touching other colours except your own? To make the game even more thrilling, colours are set to change really fast, requiring attention and accuracy from the player’s part. So are you ready to smash the highest score? 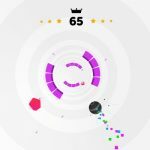 We are here to offer you all the Snake VS Colors cheats and tips that you need to know in order to improve your high score! The more you play, the more accurate your moves will be. The aim of the game is simple: slide your finger to lead your snake through obstacles. There are two modes you can choose from: the level-based mode and the endless mode, each one of them with its own set of challenges. If you fail a level once, you will get the opportunity to play it again next time you start the mode. In the endless mode, the levels are random and you will have to face all the possible obstacles and colours. If you want to get better and better at Snake VS Colors, you need to play a lot …and fail a lot. There’s no other way around it. If you don’t play, you won’t have the chance to get used to the puzzles’ layout and learn how to spot traps. From every fail, you will learn a new thing. So don’t get discouraged if you fail a lot. There are certain obstacles that tend to be more annoying than others. For example, the four blocks self-destructing squares. If you want to avoid getting killed, try to go behind them. Most of the times, they will shoot towards the centre. Another example of annoying obstacles could be dots. Though at first they stay still, they will start flying around the screen. And that’s when you can put your dexterity to a good test! On certain levels, the path your snake has to follow is pretty obvious, no matter if we are talking about a path made by dots or one with obstacles on the sides. However, passing through your colours might get tricky. If you come across a thin strip that has the same colour as your snake, stick to it. Or you may head towards an instant death. Make sure to make the most of your map. If you see big clusters of obstacles concentrated in the middle, try moving to the edge. You may increase your survival chances. So make sure to carefully watch the map and pick your route. There are no obstacles that can’t be dodged if you make precise and fast moves and are to foresee where the obstacles might pop up from. 5. Curious To See How Well You Are Doing? If you tap on the trophy icon, you will be able to compare your score with the scores other players have obtained. Depending on the platform you are playing on, you can either use Google Play or Game Center. This is where our compilation of Snake VS Colors tips and tricks comes to an end. If you found our guide useful or if there is anything else you would like to add to it, don’t hesitate to use the comments section below.